On a lightly floured board unfold 1 sheet of puff pastry and roll it slightly until it’s a 10 by 10-inch square. Repeat with the second sheet of puff pastry. Working quickly but carefully cut each of the sheets into quarters with a sharp knife. Place four squares on each lined sheet pan and place in the refrigerator until needed and while the filling is being prepared. It is important to keep the puff pastry cold and not allow it to become warm. Place the cream cheese and sugar in the bowl of an electric mixer fitted with a paddle attachment and cream them together on low speed until smooth. With the mixer still on low, add the egg yolks, ricotta, vanilla, salt, and lemon zest and mix until just combined. Remove the sheet pans with puff pastry from the refrigerator and place one heaping tablespoon of the cheese filling into the middle of each of the 8 squares. Using a rubber pastry brush; brush the border of each pastry with egg wash. Then fold one corner to the center, brushing with the egg wash and then overlapping the opposite corner of the pastry, pressing so they firmly stick together. Brush the tops of all the pastries with egg wash so they brown beautifully. With the remaining 1 Tbs of sugar; sprinkle the tops of the prepared Danish with a pinch of the granulated sugar. 1 Tbs should be more than enough for the 8 danish. 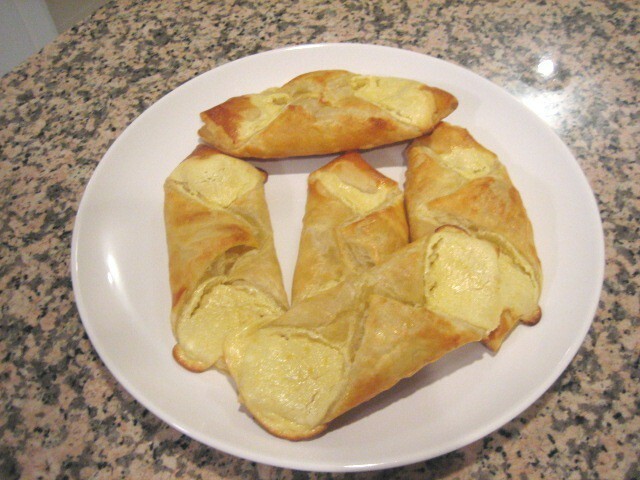 Place the prepared Danish in the refrigerator to set up for 15 minutes BEFORE baking. Bake the pastries for about 20 minutes; rotate the pan once during baking, until puffed and brown. Allow the Danish to cool on wire racks before serving.